On the 3rd December 1917 a conference between a Russian delegation, headed by Leon Trotsky for Russia, Richard von Kühlmann for Germany, and Count Ottokar Czernin for Austria-Hungary (the Ottoman Empire and Bulgaria were also represented) began at Brest-Litovsk (now Brest, Belarus). Trotsky had the difficult task of trying to end Russian participation in the First World War without having to grant territory to the Central Powers. By employing delaying tactics Trotsky hoped that socialist revolutions would spread from Russia to Germany and Austria-Hungary before he had to sign the treaty. After nine weeks of discussions without agreement, the German Army was ordered to resume its advance into Russia. On 3rd March 1918, with German troops moving towards Petrograd (Leningrad, now Saint Petersburg), Vladimir Lenin ordered Trotsky to accept the German terms. Russia recognized the independence of Ukraine and Georgia; confirmed the independence of Finland; gave up Poland, the Baltic states, and part of what is now Belarus to Germany and Austria-Hungary; and ceded Kars, Ardahan, and Batum to the Ottomans. 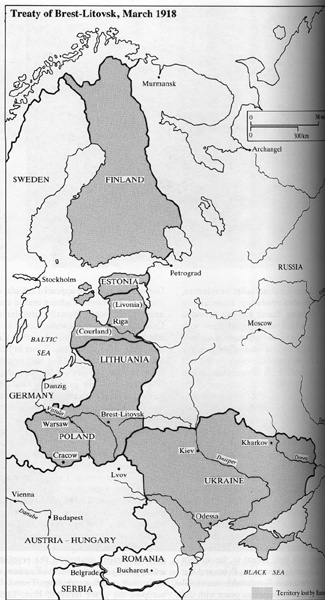 Territories surrended by Soviet Russia due to Brest-Litovsk treaty. The Russians lost more than 300,000 square miles of territory and in excess of 50 million people. Of greater significance, however, was the loss of huge sources of iron and coal in the ceded areas. From the Allied perspective, the treaty was a disaster in that it allowed the Germans to transfer soldiers to the Western Front, where they immediately gained numerical superiority. The general armistice of Nov. 11, 1918, forced Germany to renounce the treaty, and Russia also declared it null and void. The western frontiers of Russia were later agreed upon by a series of separate treaties.